Streetcars do more than simply improve mobility. By promoting development, raising property values, attracting businesses and residents, and helping to redefine our city, streetcars benefit everyone. There are a variety of options and programs for local businesses and corporate partners to take advantage of KC Streetcar’s integration into the city. What is a Smart City Digital Kiosk and how can your business get involved with this innovative digital platform for advertising and promotional purposes? 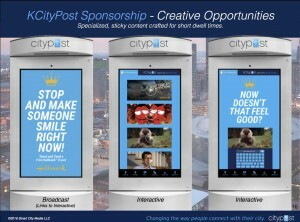 Click here to preview the KCityPost Media Kit – KC City Post Media Kit– for more information on how your small business can participate in the advertising program that has been developed for the KC Streetcar Digital Kiosks. For direct Smart City Digital Kiosk questions, please contact Mike Mainthow with Smart City Media, LLC, at (914) 960-3695. Sign up below and someone will be in touch with you.